I'm excited for this weekend's Riot Fest for a long list of reasons,* and near the top of the list is the punk blowout's embrace of hip-hop. It speaks volumes of the way festival organizers continue to broaden the scope of bands that can be roped into this particular megacarnival. True, rap's inclusion on this year's bill isn't very thoroughgoing—hip-hop acts make up a small fraction of the festival lineup, and instead of being spread strategically throughout the weekend, most were lumped in on the same day. And yet I'm more interested in catching the four rap sets than I am in, say, bingeing on nostalgia-inducing performances. Then again, I'm eager to see one of the hip-hop acts in part because of a fond memory of the first time I saw the group in concert. Nearly a decade ago I went to Warped Tour** with the explicit intention of seeing only a few bands, including the Minneapolis indie-rap outfit Atmosphere, which at the time was on the rise after releasing Seven's Travels. I'd been mildly obsessed with that album, or at least what little of that album I could hear with a LimeWire account and a dial-up Internet connection. I pored over tracks such as "Reflections," "National Disgrace," and (of course) "Trying to Find a Balance," rapping them a cappella to friends between bites of lunch during my senior year of high school. If seeing Atmosphere meant I had to spend a summer day listening to a bunch of tepid mall-punk bands bash away for several hours, so be it. When the time came for Atmosphere to take the stage that afternoon, sound issues made it seem like it wouldn't happen at all—if I recall correctly, Slug told the crowd the root of the problem came from someone spilling beer on the soundboard. 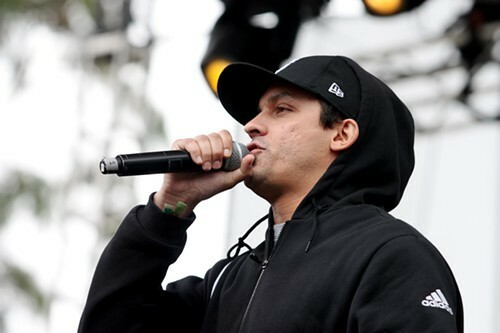 Rather than be deterred, Slug announced he'd spend Atmosphere's set surrounded by the crowd and hopped offstage, mike in hand, to join his fans, who quickly cleared paths for the MC as he waded through the pack of sweaty listeners. Slug moved as easily as he rapped, though he ended up spending most of the set comfortably parked near me. I can't remember many details (I couldn't tell you the set list, for one thing), but all these years later I still recollect the giddy energy, vitality, and fervor of that half-hour performance. It came across as refreshingly punk, and though I've since seen many a musician break the fourth wall like it's as requisite a part of a live performance as an encore, Slug's gesture still strikes me as different; it was sincere and of the moment, done without the intention of falling in line with some regimented idea of how a performance at Warped Tour should go. And it made much more of an impression on me than any of the pop-punk groups instructing kids to form circle pits did that day. In fact, I can barely recall any of the other bands that played Warped Tour that year, though I want to say Yellowcard showed up. Both Atmosphere and Yellowcard are playing Riot Fest on Friday (they're actually both on the Riot Stage); to me the Florida pop-punk band is much more representative of the festival's focus on nostalgia than Atmosphere, despite my own soft spot for the indie-rap stalwart. But that's largely because in my mind Yellowcard remains frozen in amber as that punk group with a violin player that had one kinda OK sugary hit, whereas Atmosphere reliably pumps out solid albums every handful of years. Still, as much as I look forward to hearing how 2011's The Family Sign sounds live, I'll really flip out when I hear "Trying to Find a Balance." *The list is mostly just a compilation of names of bands playing throughout the weekend. **Yes, I went to Warped Tour. On multiple occasions, actually. The main background on my Twitter profile is actually a photo I took of P.O.S. rapping at Warped Tour in the summer of 2009.